Nearly one in 10 Americans admit to shoplifting at some point in their lifetime. Every year, shoplifters boost more than $13 billion worth of merchandise. Only one in 48 shoplifters are ever caught. Less than half face criminal prosecution. These numbers stand even with on-site personnel to help watch the store. How much worse would these statistics be in the absence of cashiers to monitor everything? The world is about to learn why. There’s no queuing, scanning or checkout at the cashier counter. Instead, all payments happen automatically and wirelessly using virtual wallets connected to the customer’s smartphone. Why are stores exploring this approach? Equally important, will the cashierless business model work? As with most retail decisions, the primary reason for using cashierless stores comes down to profit. If customers don’t have to wait in line and go through the painful process of scanning items one by one, stores will be able to generate more sales using fewer resources. The most famous example of the emerging cashierless store trend is Amazon Go — a supermarket where customers’ phones wirelessly connect with turnstiles, inventory and baskets to log which items should be deducted from users’ associated credit cards and bank accounts. Amazon’s infrastructure relies on a mix of near field communication (NFC) and Bluetooth technology to help establish real-time, wireless connections with its customers’ mobile wallets. The company hopes this will help reduce friction during the checkout process, allowing it to generate more sales per unit of time. According to a recent survey from American Express and EnsembleIQ, the average transaction time for mobile wallets is less than 60 seconds — compared to roughly two minutes for most credit and debit card sales. This novel approach also reduces staffing costs, allowing cashierless stores to keep more of every sale they make. With enough automation and robotic technology, in fact, it may be possible to eliminate employees entirely. Albert Heijn — a grocery store in Holland that recently launched a few pilot stores. Starbucks is looking to introduce a fleet of cashierless coffee shops in urban centers around the globe. Sam’s Club Now is Walmart’s attempt to bring the cashierless model to big-box retail. Almost all of these examples are still in the early testing stages. Whether these pilot projects eventually go mainstream remains to be seen. Will the Cashierless Business Model Succeed? Without a properly configured smartphone, it’s very difficult (if not impossible) to gain entry to any of these cashierless stores. Once a wireless connection has been established, every item that you grab is instantly logged. As such, shoplifting isn’t really a concern with the cashierless model. Not everyone has a smartphone. Fewer still use virtual wallets such as Apple Pay. Fortunately, however, this trend is quickly changing as the technology becomes cheaper and more ubiquitous. Grocery stores that use self-checkout lanes still need someone on-site to help customers troubleshoot issues. This type of support will be even more crucial in cashierless stores — especially for first-time shoppers. The cashierless approach is ideal for fast-moving consumer goods such as toiletries, produce and other staples. For bigger-ticket items, though, this business model might not work if customers have questions or concerns about whatever they’re about to buy. Should You Jump into the Cashierless Store Trend? Probably not yet. That’s because there’s one final hurdle retailers need to overcome — namely cost. 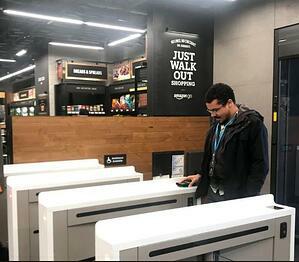 To launch its first cashierless store, for example, Amazon spent more than $1 million — just in hardware costs alone. Most retailers don’t have that kind of money to burn. If you run a small to medium business, it probably makes sense to wait until the technology becomes more affordable and accessible. However, you can start dipping your toe in the water by updating your legacy payment environment with NFC terminals. You’ll still need cashiers to man the tills, but with NFC technology under the hood, you can begin offering contactless payments to your customers.